Background Oral lichen planus (OLP) is a chronic inflammatory disease of unknown etiology and pathogenesis with frequent relapses. OLP has several patterns; some are asymptomatic whereas others may affect patient’s quality of life. Corticosteroids (CS) (either topical, intralesional, or systemic) are the cornerstone in OLP treatment. Unfortunately, CS are associated with variable local and systemic adverse effects; therefore, other therapeutic modalities have been tried for OLP treatment. Among these modalities was the Bacillus Calmette-Guerin polysaccharide nucleic acid extract (BCG-PSN). Aim The aim of this study was to evaluate the efficacy, safety, and recurrence after intralesional BCG-PSN injection in comparison with intralesional triamcinolone acetonide (TA) injection in treatment of OLP. Patients and methods BCG-PSN was extracted from BCG vaccine in the Immunology Research Laboratory, Department of Microbiology and Immunology, Zagazig University. A total of 26 patients with clinically proved OLP were enrolled in the study. They were divided into two groups (group A and group B). Group A included 13 patients with OLP who were treated with two intralesional injections of TA (20 mg/ml) once weekly for 2 weeks. Group B included 13 patients with OLP who were treated with six intralesional injections of BCG-PSN, 0.5 ml every other day for 2 weeks. The responses of OLP lesions to intralesional injection of BCG-PSN and TA were evaluated based on reduction in their surface area. A semiquantitative (reticulation/erythema/ulceration) scoring system was used for monitoring the response of OLP lesions. Pain was assessed using a numerical rating scale. Results No statistically significant differences were found between the groups in the reduction of erosion areas (t=7.10, P=0.47), reticulation/erythema/ulceration scores (t=80.5, P=0.83), and numerical rating scale scores (t=80.0, P=0.81). There was no statistically significant difference between both groups regarding the response to therapy (χ2=1.87, P=0.39). Nonsignificant difference was found in the occurrence of adverse effects between the groups (P=0.500). There was nonsignificant difference in the recurrence rate (77.8 vs. 71.4%, P=0.61) between the two groups. Conclusion Intralesional BCG-PSN injection can be used as an effective alternative to intralesional TA in the treatment of OLP especially in patients resistant to or with contraindications for CS. Oral lichen planus (OLP) is a chronic inflammatory disease of unknown etiology affecting the oral mucosa. Its prevalence ranges from 0.5 to 3%. It is slightly more common in adult females than in males. OLP has multiple variable clinical presentations. The most common form is the reticular pattern, which is almost asymptomatic, and therefore it is often discovered accidently during oral examination for any other cause. Other asymptomatic forms include the papular and the plaque patterns, but these forms are relatively uncommon. On the contrary, the erosive/ulcerative, atrophic, and bullous patterns are usually associated with variable degrees of pain and discomfort that may affect quality of life of patients with OLP in the form of dysphagia and even inability to speak owing to severe pain and even bleeding . The exact etiology of OLP is still unknown. Several factors have been suspected including infections [mainly hepatitis C virus (HCV)], dental prostheses (mainly those made of amalgam), psychological stress, and various drugs such as gold salts, penicillamine, sulphonylureas, angiotensin-converting enzyme inhibitors, methyldopa, and allopurinol . The underlying pathogenesis of OLP is still controversial. Most studies have found that OLP is a ‘T-cell-mediated autoimmune disease’ in which unknown antigen (either self-antigen or foreign antigen) trigger a T-helper l (Thl)-mediated immune response with subsequent activation of CD8+ cytotoxic T cells that attack oral epithelial cells leading to their apoptosis. However, other studies have found that OLP occurs may be because of a Th2-mediated immune response rather than a Th1-mediated immune response . Corticosteroids (CS), either topical or systemic, are the cornerstone in OLP management. In mild disease, topical CS are applied to OLP lesions in various forms including ointment, mouthwash, spray, or paste. In severe disease, systemic CS are the drug of choice, but this option is associated with variable systemic adverse effects. Intralesional CS injection such as triamcinolone acetonide (TA) has been proven to be effective in treatment of OLP. This modality has better immune-suppressing and anti-inflammatory effects than other topical steroids owing to higher concentration of steroids locally. Moreover, intralesional CS injection has fewer systemic adverse effects than systemic CS . Unfortunately, patients with contraindications to CS, those with lesions resistant to CS, and those who developed adverse effects owing to prolonged use of CS are in need of other therapeutic modalities. Several topical and systemic medications have been used in the treatment of OLP with variable efficacy. Topical medications, usually used for mild disease, include tetracycline, tacrolimus, pimecrolimus, cyclosporine, retinoids, and amlexanox paste 5% . On the contrary, severe or extensive disease requires systemic medications such as doxycycline, hydroxychloroquine, dapsone, levamisole, azathioprine, methotrexate, mycophenolate mofetil, and thalidomide. Biological therapies, including alefacept, efalizumab and rituximab, have also been reported to be occasionally effective in OLP management. Carbon dioxide laser, Nd : YAG laser, the 308 nm ultraviolet B (UVB) excimer laser, and cryosurgery have been used in the treatment of OLP. Surgical excision of lesions is recommended in cases of persistent ulcers or transformation into squamous cell carcinoma . Bacillus Calmette-Guerin polysaccharide nucleic acid extract (BCG-PSN) is an extract prepared from the BCG vaccine in certain methods to get rid of the protein content which is the main cause of occurrence of local adverse effects such as abscess formation while preserving the polysaccharide and nucleic acid components, which are ‘immunologically active’ . BCG-PSN was found to be able to regulate the subsets of T cells (T-helper and T-cytotoxic cells) and reverse the imbalance of Thl/Th2 ratio to a ‘balanced state’ . Zhou et al. have found that BCG-PSN could regulate the Thl/Th2 cytokine secretion in peripheral blood mononuclear cells of patients with OLP in an in-vitro experiment. Intramuscular BCG-PSN injection has been used as one of the effective traditional therapeutic modalities for OLP management in China. Intralesional BCG-PSN injection has been demonstrated to be as effective as intralesional TA injection in the treatment of erosive OLP . The aim of this study was to compare intralesional BCG-PSN injection versus intralesional TA injection in the treatment of OLP regarding response to treatment, occurrence of adverse effects, and recurrence of lesions. BCG-PSN was extracted from BCG vaccine in the Immunology Research Laboratory, Department of Microbiology and Immunology, Zagazig University, according to Kocagoz et al. and Marei et al. . Briefly, one lyophilized vial of BCG (provided by Vacsera, Geza, Egypt), each 0.1 ml contains between 1×105 and 33×105 colony forming unit, was reconstituted in aliquot of 1 ml saline. Then, 1 ml was transferred to a sterile 1.5 ml Eppendorf tube (MerkGaA, Darmstade, Germany) and kept at 4°C for 15 min. Lysozyme (l0 mg/ml final concentration) was added, and the tube was incubated at 4°C for 30 min. Then, proteinase K (100 μg/ml final concentrations; Q1AGEN, Manchester, UK) was added, and the tube was incubated at 56°C for 5 h. The tube was heated at 95°C for 10 min to inactivate proteinase K and cooled at 4°C for no more than 5 h. The sample was then centrifuged at 12 600 g for 5 min, and the supernatant was removed to a new 1.5 ml Eppendorf tube and completed to 1 ml saline. The preparation did not involve the use of phenol which may induce several adverse effects such as hypersensitivity, skin necrosis, and central nervous system toxicity . A total of 26 patients with OLP (14 males and 12 females), with age ranged from 12 to 76 years and a mean age of 52.27±14.23 years, were enrolled in this study. The selected cases included symptomatic OLP of the erosive-ulcerative and the atrophic types. They were randomly collected from the Outpatient Clinics of the Department of Dermatology and Venereology, Zagazig University Hospitals, from October 2015 to October 2016. The diagnosis of OPL was made based on history and clinical presentation. Clinical criteria of diagnoses included the presence of keratotic pinhead-sized white slightly elevated papules (papular) lichen planus which may be discrete or arranged in reticular (reticular lichen planus) pattern. The diagnoses of atrophic lichen planus included the appearance of atrophic red areas within the white lesions, whereas the diagnoses of ulcerative lichen planus included the presence of areas of well-defined ulceration within the aforementioned lesions . Each patient was subjected to complete history taking, general examination, and detailed dermatological examination. In addition, the following laboratory investigations were done: complete blood cell count, random blood sugar, anti-HCV antibody, liver function tests, and ultrasound examination of abdomen. This study was approved by Institutional Review Board at Faculty of Medicine, Zagazig University. Written informed consent to participate in this study was obtained from all participants. The following patients were excluded from this study: patients with other severe oral mucous diseases such as pemphigus or Stevens-Johnson syndrome More Details, patients received immunosuppressive drugs during the previous 3 months, those who had applied topical treatment within a week before the study, those with bleeding tendency, pregnant or lactating females, and patients with active viral, bacterial, or fungal infections. Patients were given serial numbers and randomly divided into two groups (groups A and B) according to the treatment modality. Group A (odd numbers) included 13 patients with OLP who were treated with two intralesional injections of TA [kenacort (Bristol Mayer Scuibb, Cairo, Egypt), 40 mg/ml vial mixed with 1 ml of lidocaine 2%, with 20 mg/ml final concentration], once weekly for 2 weeks. TA was administered as multiple 0.2 ml injections at 1 cm intervals. Patients with history of recurrent herpes simplex infections and those with history of allergy to steroids were excluded from group A. Group B (even numbers) included 13 patients with OLP who were treated with six intralesional injections of BCG-PSN, 0.5 ml every other day for 2 weeks. Patients with fever, generalized rash, and those with history of allergy to BCG vaccination were excluded from group B. In both groups, topical anesthetic spray [lignocaine (Arabdrug Co., Cairo, Egypt), 10 ml/dose] was applied to the site of injection. After 3 min, injection was done using insulin syringe with a 0.5-inch long, 30 G needle. 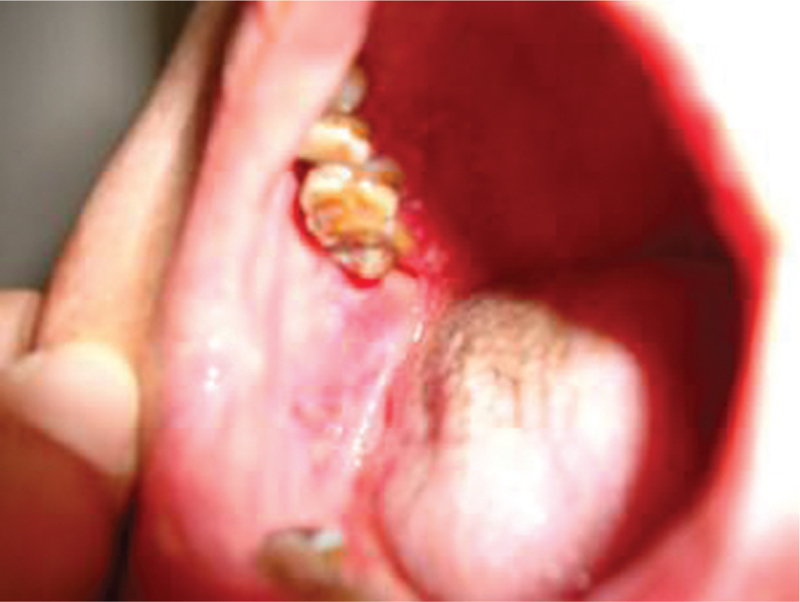 To avoid or at least minimize bleeding following injection, the injection was administered into the base of the lesion through adjacent intact mucosa not the lesion itself, followed by pressure with sterile gauze for 3–5 min. The responses of OLP lesions to intralesional injection of BCG-PSN and TA were evaluated based on reduction in their surface areas. The lesion area was obtained by the multiplication of the maximum diameter of the lesion and the maximum width perpendicular to it as measured by a sterile William’s periodontal probe. The response was classified as complete or almost complete response (CR; 80–l00% reduction), good response (50–79% reduction), partial response (20–49% reduction), no response (>20% reduction), or worsening . 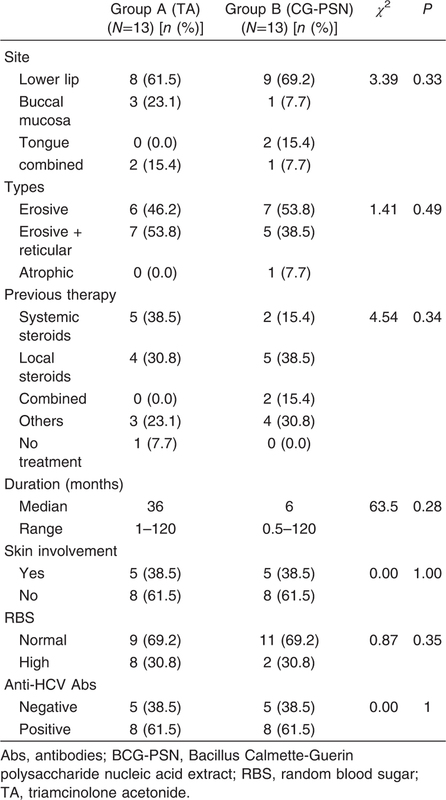 The severity of OLP lesion in each site was scored according to a semiquantitative reticulation/erythema/ulceration (REU) scoring system ([Table 1]) . Pain was assessed using a numerical rating scale (NRS). Patients were asked to assign a numerical score representing the intensity of their pain on a scale from 0 to 10, with 0 being no pain and l0 being worst imaginable pain . Digital photographs of the lesion were taken using digital camera (Sony DSC-W530, Tokyo, Japan). Photographs of the lesions before, during, and after treatment were compared. The injection was discontinued if the lesion disappeared or adverse effects occurred. Patients with CR (reduction in lesion areas ≥80%) were followed up every 2 weeks for 3 months to detect recurrence of OLP lesions at the same site and record the recurrence interval. On the contrary, patients with reduction in lesion areas less than 80% after 2-week treatment received other lines of treatment without follow-up research visits. For data analysis, SPSS version 19.0 (SPSS Inc., Chicago, Illinois, USA) was used, and the following tests were used: χ2-test, Student’s t-test, paired samples t-test, one-way analysis of variance, Fisher’s exact test Kruskal–Wallis test, and Mann–Whitney U-test. Results were expressed as mean±SD, median, range, numbers, or percentages. P value less than 0.05 was considered statistically significant, and P value less than 0.001 was considered statistically highly significant. A total of 26 patients with OLP were enrolled in this study. Their age ranged from 12 to 76 years, with a mean of 52.27±14.23 years. They included 12 (46.2%) female patients and 14 (53.8%) male patients. Male to female ratio was 1.2 to l. Lower lip was affected in 18 (69.2%) patients. 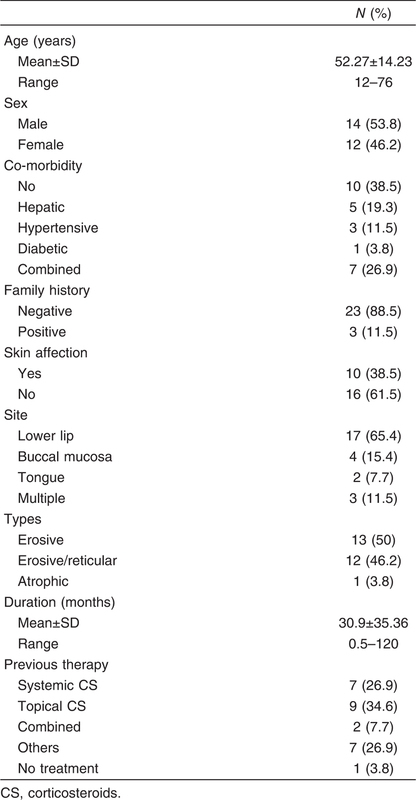 Buccal mucosa was affected in seven (26.9%) patients. Tongue was affected in five (19.2%) patients. Moreover, three (11.5%) patients had multiple sites affected. Erosive OLP was found in 25 (96.1%) patients with associated reticular lesions in 12 (46.2%) patients of them. Only one (3.8%) patient had atrophic OLP. Associated cutaneous lichen planus (LP) lesions were found in 10 (38.5%) patients. 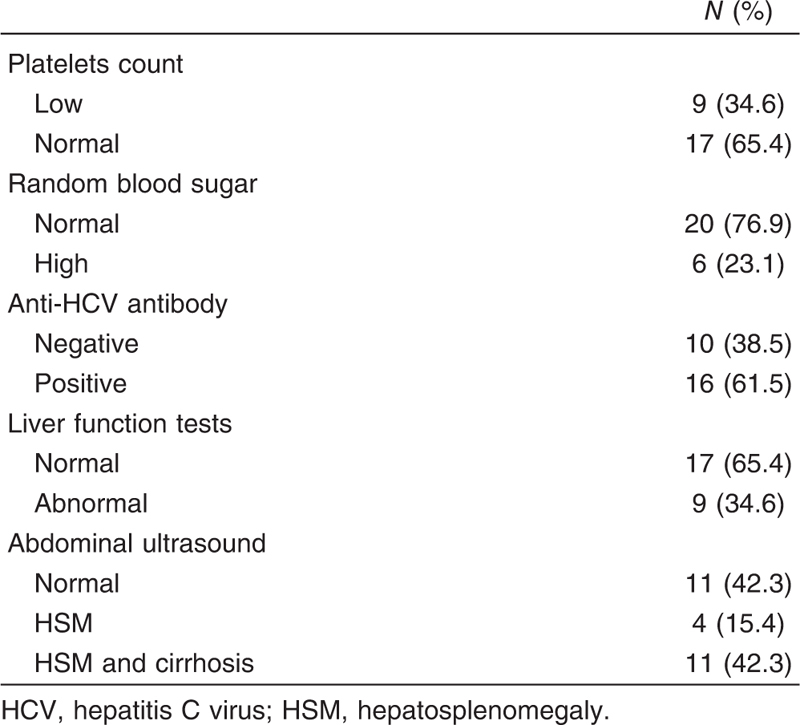 Anti-HCV antibody was positive in 16 (61.5%) patients, with four of them were first discovered in this study. 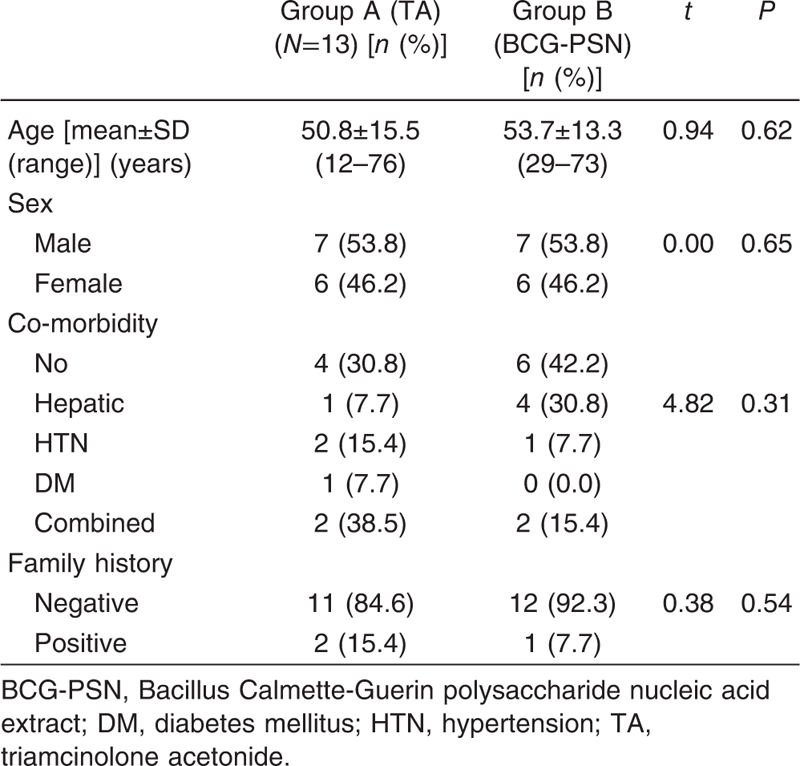 Overall, six (23.1%) patients were diabetic with high random blood sugar ([Table 2] and [Table 3]). Patients were divided into two groups. Group A included 13 patients treated with intralesional injection of TA, and group B included 13 patients treated with intralesional injection of BCG-PSN. There were no differences between the two groups regarding demographic ([Table 4]), clinical, and laboratory data ([Table 5]) at baseline. In TA-treated group, there were statistically highly significant differences in the reduction of erosion areas (t=4.6, P<0.001**), REU scores (t=3.55, P<0.001**), and NRS scores (t=5.29, P>0.001**) after 2-week management. 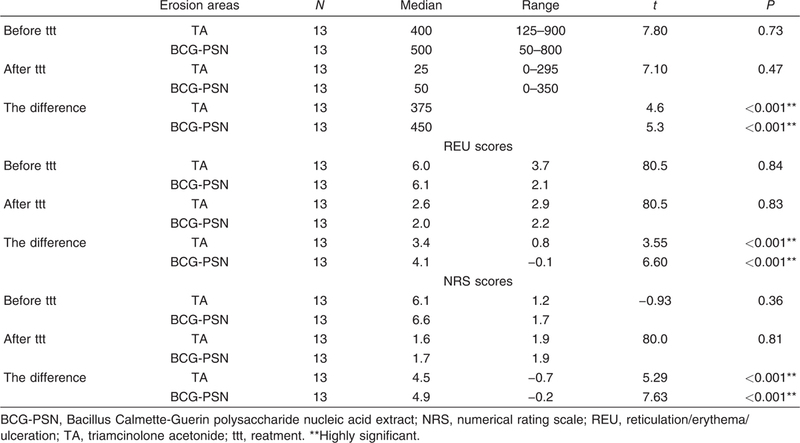 In BCG-PSN-treated group, there were also highly statistically significant differences in the reduction of erosion areas (t=5.3, P<0.001**), REU scores (t=6.6, P>0.001**), and NRS scores (t=7.63, P<0.001**) after 2-week management. However, there were no statistically significant differences between the two groups in the reduction of erosion areas (t=7.10, P=0.47), REU scores (t=80.5, P=0.83), and NRS scores (t=80.0, P=0.81). These results are demonstrated in [Table 6]. After 2-week treatment, nine (69.3%) of 13 patients in TA group and seven (53.9%) of 13 patients in BCG-PSN group showed CR with reduction of erosion areas ranged from 80 to 100%. Overall, five (38.5%) patients in each group showed complete healing and disappearance of OLP lesions. In addition, two (15.4%) patients in TA group and five (38.5%) patients in BCG-PSN group showed good response with improvement ranged from 50 to 79%. However, two (15.4%) patients in A group and one (7.7%) patient in BCG-PSN group showed no response, with improvement less than 20%. There was no statistically significant difference between both the groups regarding the response to therapy (χ2=1.87, P=0.39). These results indicated that both intralesional BCG-PSN injection and intralesional TA injection were almost of the same efficacy in the treatment of OLP. It was observed that the reticular lesions persisted in two patients who showed complete resolution of erosions and complete pain relief. In TA group, two (15.4%) of 13 patients developed adverse effects in the form of atrophy and persistent erythema following treatment. In BCG-PSN group, three (23.1%) of 13 patients experienced mild swelling at the injection sites. This swelling developed within 24 h after injection but resolved spontaneously within 1 week. Statistically, there were no significant differences in the occurrence of adverse effects between the two groups (P=0.500) ([Table 7]). These results indicated that both BCG-PSN and TA were similarly safe in the treatment of OLP with few adverse effects in both of them. A total of 16 patients (nine of TA group and seven of BCG-PSN group) who showed CR were followed up every 2 weeks for 3 months to detect recurrence of new erosive lesions at the same site. During the follow-up period, seven (77.8%) patients of TA group and five (71.4%) patients of BCG-PSN group showed recurrence. Statistically, there were no significant differences in the recurrence rate (77.8 vs. 71.4%, P=0.61) between the two groups. Overall, four patients, two in each group, remained free with no recurrence ([Table 8]). Regarding response to treatment and recurrence, there were no statistically significant differences between HCV-positive and HCV-negative groups ([Table 9] and [Table 10]). Case presentations are given in [Figure 1],[Figure 2],[Figure 3],[Figure 4],[Figure 5],[Figure 6],[Figure 7],[Figure 8]. Figure 1 Female patient, 65 years old, anti-HCV antibody positive. Showing erosive/ulcerative OLP at lower lip, before treatment with intralesional BCG-PSN injection. Figure 2 Female patient, 65 years old, anti-HCV antibody positive. Showing complete healing of the erosive lesions (complete response) after two-week treatment with intralesional BCG- PSN injection. Figure 3 Female patient, 50 years old, anti-HCV antibody negative. Showing erosive and reticular OLP at right buccal mucosa, before treatment with intralcsional BCG-PSN injection. Figure 4 Female patient, 50 years old, anti-HCV antibody negative. Showing complete healing of the erosive lesions (complete response) after two-week treatment with intralcsional BCG-PSN injection. Figure 5 Male patient, 73 years old, anti-HCV antibody positive. Showing erosive OLP at lower lip, before treatment with intralesional BCG-PSN injection. Figure 6 Male patient, 73 years old, anti-HCV antibody positive. Showing complete healing of the erosive lesions (complete response) after two-week treatment with intralesional BCG-PSN injection. Figure 7 Male patient, 40 years old, anti-HCV antibody positive. 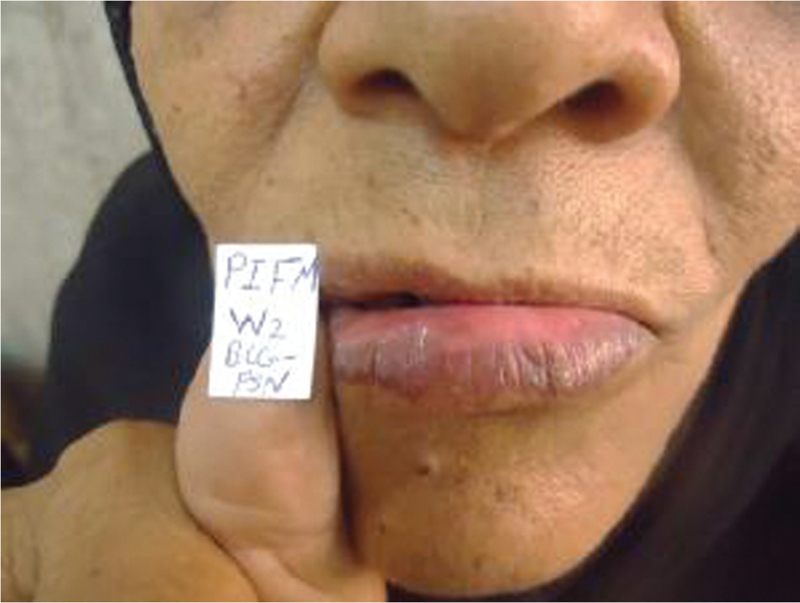 Showing erosive/ulcerative OLP at lower lip, before treatment with intralesional TA injection. Figure 8 Male patient, 40 years old, anti-HCV antibody positive. Showing nearly complete healing of the erosive lesions (complete response) after two-week treatment with intralesional TA injection. OLP is a relatively common chronic inflammatory disease of unknown etiopathogenesis. The most common form of OLP is the reticular pattern which is often asymptomatic; therefore, it usually does not require treatment. On the contrary, other forms such as the erosive/ulcerative pattern are usually associated with pain, which may cause dysphagia with subsequent adverse effect on patients’ quality of life . CS are the cornerstone in OLP treatment. They can be administered either topical, intralesional, or even systemic according to the severity of the disease. Unfortunately, being of chronic nature with unpredictable remissions and exacerbations, repeated administration of CS for long periods may be necessary for control of OLP disease with subsequent increase in the likelihood of occurrence of local and systemic adverse effects . A polysaccharide and nucleic extract has been prepared from BCG, known as BCG-PSN. It is considered as an immune modulator compound. It has been used in the treatment of various dermatological and respiratory disorders. Among the dermatological diseases for which BCG-PSN was found to be effective is OLP . This study aimed at evaluation of the efficacy, safety, and recurrence after intralesional injection of BCG-PSN in comparison with intralesional injection of TA in the treatment of OLP. In the present study, there were statistically highly significant differences in reduction of erosion area, REU scores, and NRS scores after 2-week treatment in both TA-treated and BCG-PSN-treated groups. 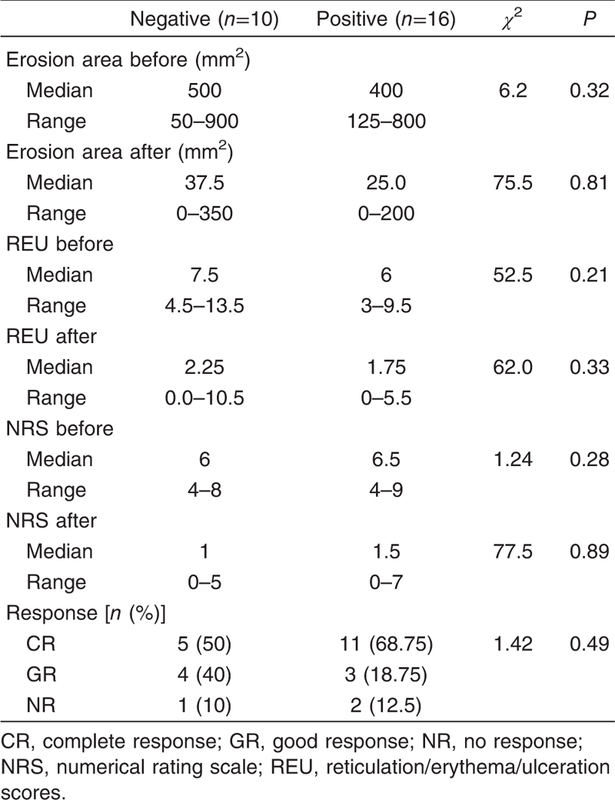 However, there were no statistically significant differences between the two groups in the reduction of erosion areas, REU scores, and NRS scores in patients with OLP. Overall, nine (69.3%) patients in TA-treated group and seven (53.9%) patients in BCG-PSN group achieved CR, with reduction of erosion areas ranging from 80 to 100%. These results are consistent with that reported by Xia et al. who showed that a single TA injection (of concentration 40 mg/ml) resulted in rapid decrease in visual analog scale (VAS) score, erythematous areas, ulcerative areas, and REU scores. Complete healing of lesions was reported in 51.1% of patients, and erythema was reduced in 71.1% of cases within 2 weeks. Similarly, Kuo et al. reported complete healing of the erosive OLP lesions after 3-week treatment with intralesional TA injection (40 mg/ml once weekly for 3 and 2 weeks) combined with oral administration of prednisolone (25–30 and 15–20 mg once daily for 2 weeks). Approximately 90% of patients showed CR (lack of detectable erosive or ulcerative lesion with absence or regression of reticular or papular OLP). Partial response (reduction of erosive or ulcerative lesion by at least 30% in diameter with regression of reticular or papular OLP) was achieved in the remaining 10% of patients. Our results are also consistent with that reported by Xiong et al. where there were significant differences in the reduction of erosive areas and VAS scores of TA-treated group after 2-week management. Moreover, there were significant differences in the reduction of erosive areas and VAS scores of BCG-PSN-treated group. However, there were no statistically significant differences between the two groups in the reduction of erosive areas and VAS scores. However, Xiong et al. reported that complete healing of the erosive lesions was observed in 22 (88%) of 25 TA-treated patients and 27 (87.1%) of 31 BCG-PSN-treated patients. This percentage was higher than that in our study (38.5% in each group). This may be because of the relatively much smaller lesion areas in their study (erosive area did not exceed 100 mm2), whereas the maximum lesion area in our study was ∼900 mm2. Similarly, Zhou et al. , reported that the healing rate in patients receiving combined intramuscular BCG-PSN and intralesional TA was 57.2%, whereas in those receiving only intralesional TA was 50%. This slight difference may be because of the relative longer duration of treatment in their study, which was 4 weeks, whereas it was only 2 weeks in our study. The exact pathogenesis and the Th1/Th2 balance pattern of OLP are still controversial. Several studies have suggested that OLP occurs because of a Th1-mediated immune response based on findings of strong expression of Th1 cytokines, e.g., IFN-γ and TNF-α, in OLP lesions ,. On the contrary, decreased ratios of Thl/Th2 cytokines were found in tissue transudates and saliva from patients with OLP, suggesting a role of Th2-mediated immune response in OLP pathogenesis ,. CS act by inhibiting genes that code for proinflammatory cytokines such as interleukin-1 (IL-1), IL-2, IL-4, IL-5, IL-6, IL-8, and interferon-γ. IL-2 is a potent T-cell growth factor, and decreased production of IL-2 reduces T-cell proliferation. OLP is a T-cell-mediated chronic inflammatory oral mucosal disease, and the efficacy of TA treatment in OLP is mainly attributed to its local anti-inflammatory and immunosuppressive effects, suppressing T-cell function . BCG-PSN is an immune modulator whose exact mechanism of action is still unknown. BCG-PSN has been reported to decrease the synthesis of Th2 cytokines, e.g., IL-4, and switch the ratio of Th1 Th2 to the Th1 side . On the contrary, Miao et al. reported that BCG-PSN was able to simultaneously elicit a Thl and Th2 immune response and also change the Thl/Th2 ratio mainly by enhancing the Th2 immune response. Therefore, BCG-PSN has been believed to be capable of enhancing several mechanisms with subsequent modulation of the Thl/Th2 ratio to a ‘balanced state’ . In our study, two (15.4%) of l3 patients in TA group experienced adverse effects in the form of atrophy and persistent erythema, and three (23.1%) of l3 BCG-PSN-treated patients experienced swelling at the injection sites. There were no statistically significant differences between the two groups in the occurrence of adverse effects. Similarly, Xiong et al. reported the occurrence of adverse effects in the form of burning sensation in two of 25 (8.0%) TA-treated patients and three of 31 (9.7%) BCG-PSN-treated patients. On the contrary, Xia et al. reported absence of adverse effects following 4-week treatment with intralesional injection of TA of concentration 40 mg/ml every 2 weeks. This variability may be because of the relative smaller number of patients in our study. Therefore, in future studies, we recommend to increase the number of participants and whenever possible to measure the cortisol and adrenocorticotrophic hormone levels in the serum of the patients receiving intralesional TA injection for detection of adrenal suppression as a systemic adverse effect that may occur following intralesional TA injection especially when administered for long durations . In our study, 16 patients (nine in TA group and seven in BCG-PSN group) achieved CR, and therefore, they were followed up for 3 months. At the end of the 3-month follow-up, seven (77.8%) patients of TA group and five (71.4%) patients of BCG-PSN group showed recurrence. There were still two patients in each group who showed no signs of recurrence. However, there were no statistically significant differences between the two groups in the recurrence rate. Similarly, Xiong et al. reported that after 3-month follow-up, the recurrence rate was 45.5% in TA-treated group and 33.3% in BCG-PSN-treated group, with no statistically significant differences between the two groups. Zhou et al. reported that the recurrence rate after combined intramuscular BCG-PSN and intralesional TA was 6.25% after 3–6 months, whereas the recurrence rate after intralesional TA only was 35.7%. There was a statistically significant difference between the two groups, as BCG-PSN reduced the recurrence rate. Moreover, Kuo et al. reported recurrence of OLP lesions in all patients (100%) that achieved CR after a follow-up period of 3–24 months, with an average remission period of 12 months. This may indicate that recurrence of OLP after successful treatment is inevitable, but the remission period may be variable. In conclusion, the results of this study indicate that the efficacy and safety of both intralesional BCG-PSN injection and intralesional TA injection are almost similar, making BCG-PSN a good alternative to intralesional TA injection in patients resistant to or with contraindication for CS and also to avoid the long-term adverse effects of repeated TA injection in such chronic and recurrent disease. 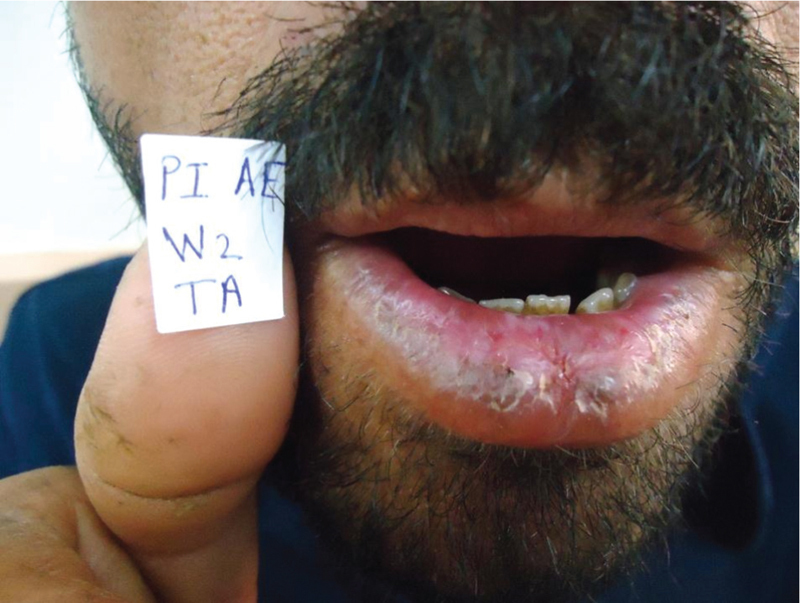 Farhi D, Dupin N. Pathophysiology, etiologic factors and clinical management of oral lichen planus.Part I: facts and controversies. Clin Dermatol 2010; 28:100–108. Koh MJ, Seah PP, Tay YK. Lichenoid drug eruption to terazosin. Br J Dermarol 2008; 158:426–427. Arias S, Aneiros J, Aceituno P. Hypertrophic lichenoid eruption due to fruosemide. Acta DermVenereol 2010; 90:78–79. 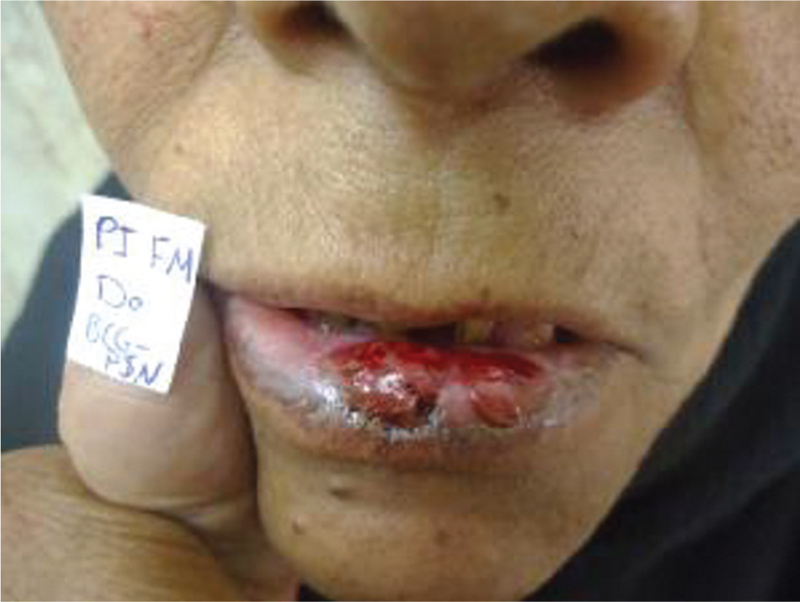 Schifter M, Yeoh SC, Coleman H. Oral mucosal diseases: the inflammatory dermatoses. Aust Dent J 2010; 55 (Suppl 1):23–38. Fu J, Zhu X, Dan H. Amlexanox is as effective as dexamethasone in topical treatment of erosive oral lichen planus: a short-term pilot study. Oral Surg Oral Med Oral Pathol Oral Radial 2012; 113:638–643. Choonhakarn C, Busaracome P, Sripanidkulchai B. The efficacy of aloe vera gel in the treatment of oral lichen planus: a randomized controlled trial. Br J Dermatol 2008; 158:573–577. Ismail SB, Kumar SK, Zain RB. 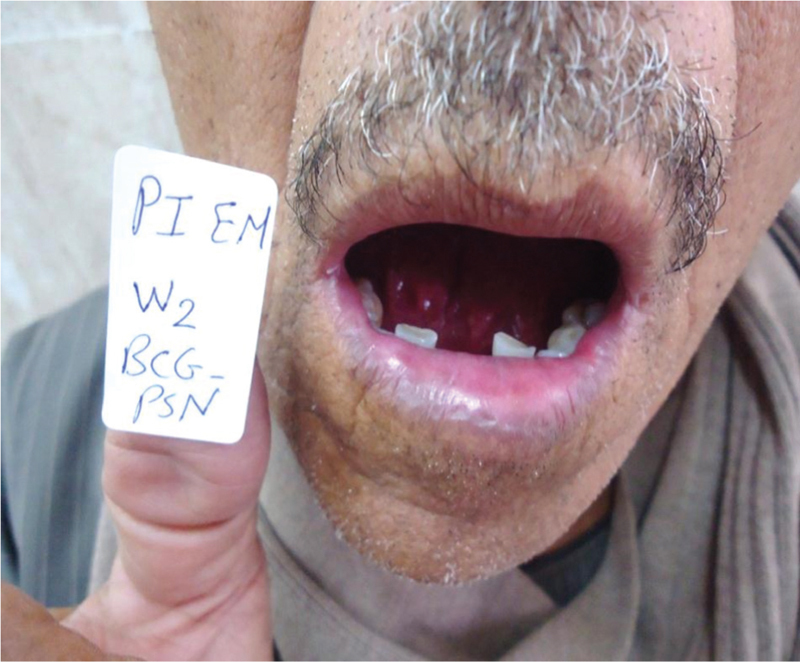 Oral lichen planus and lichenoid reactions etiopathogenesis, diagnosis, management and malignant transformation. J Oral Sci 2007; 49:89–106. Xiong C, Li Q, Lin M. The efficacy of topical intralesional BCG-PSN injection in the treatment of erosive oral lichen planus: a randomized controlled trial. J Oral Pathal Med 2009; 38:551–558. Zhou G, Fan MW, Liu JY. Regulation of BCG-polysaccharide nucleic acid on Thl/Th2 cytokines from peripheral blood mononuclear cells in oral lichen planus. Chin J Dent Res 2004; 7:5–10. Kocagoz T, Yilmaz E, Ozkara S. Detection of Mycobacterium tuberculosis in sputum samples by polymerase chain reaction using a simplified procedure. J Clin Microbial 1993; 31:1435–1438. Marei AM, El-Behedy EM, Mohtady HA. Evaluation of a rapid bacteriophage-based method for the detection of Mycobacterium tuberculosis in clinical samples. J Med Microbial 2003; 52:331–335. Groot CAU, Vermorken JB, Hanna MG Jr. Immunotherapy with autologous tumor cell-BCG vaccine in patients with colon cancer: a prospective study of medical and economic benefits. Vaccine 2005; 23:2379–2387. Ingafou M, Leao JC, Porter SR. Oral lichen planus: a reterospective study of 690 British patients. Oral Dis 2006; 12:463–468. Xia J, Li C, Hong Y. Short term clinical evaluation of intralesional triamcinolone acetonide injection for ulcerative oral lichen planus. J Oral Pathol Med 2006; 35:327–331. Piboonuiyom S, Treister N, Pitiphat W Scoring system for monitoring oral lichenoid lesions: a preliminary study. Oral Surg Oral Med Oral Pathol Oral Radial Endod 2005; 99:696–703. Closs SJ, Barr B, Briggs M. A comparison of five pain assessment scales for nursing home residents with varying degrees of cognitive impairment. J Pain Symptom Manage 2004; 27:196–205. Lehman JS, Tollefson MM, Gibson LE. Lichen planus. Int J Dermatol 2009; 48:682–694. Kuo RC, Lin HP, Sun A. 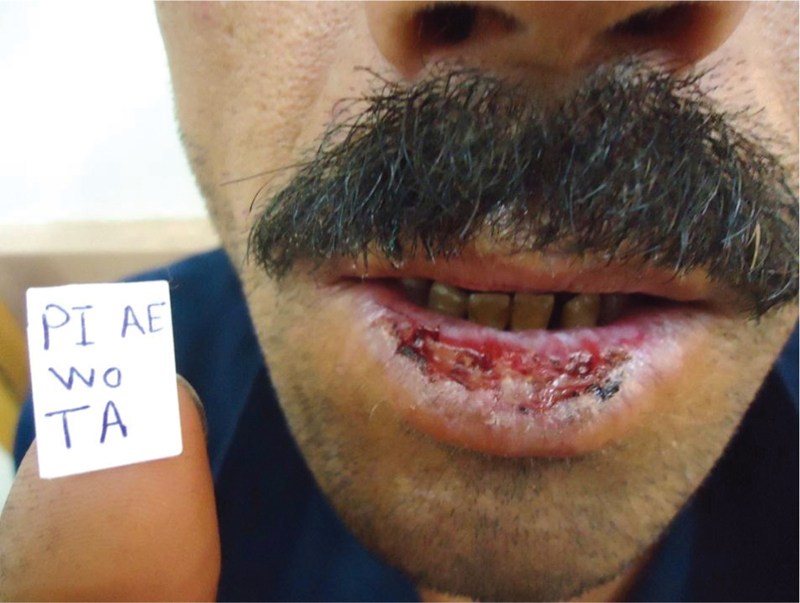 Prompt healing of erosive oral lichen planus lesion after combined corticosteroid treatment with locally injected triamcinolone acetonide plus oral prednisolone. J Formos Med Assoc 2013; 112:216–220. Zhou Y, He L, Yu X. 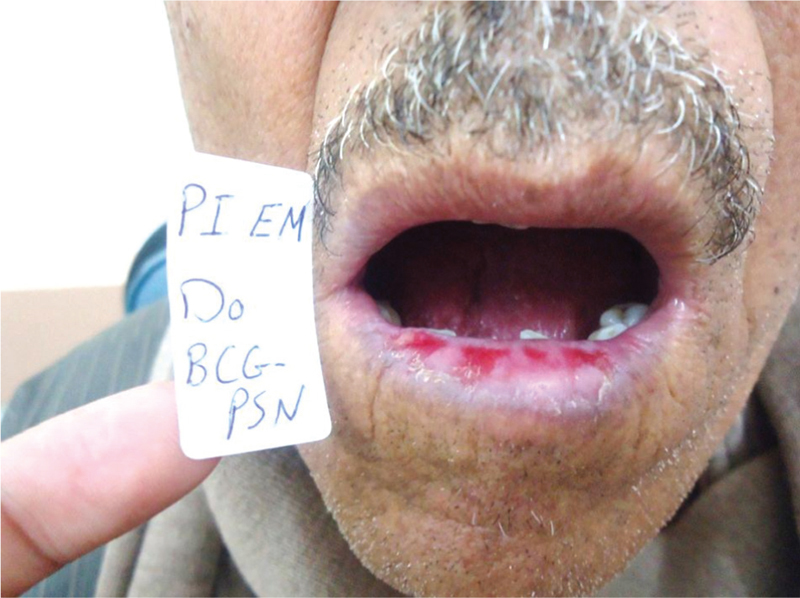 The clinical observation of treatment of oral lichen planus by triamcinolone acetonide and BCG-PSN in the aged. J Clinic Stomatol 2009; l1:54–62. Khan A, Farah CS, Savage NW. Thl cytokines in oral lichen planus. J Oral Pathol Med 2003; 32:77–83. Lu R, Zhou G, Dun G. Expression of T-bet and GATA-3 in peripheral blood mononuclear cells of patients with oral lichen planus. Arch Oral Biol 2011; 56:499–505. Rhodus NL, Cheng B, Ondrey F. Thl/Th2 cytokine ratio in tissue transudates frompatients with oral lichen planus. Mediators Inflamm 2007; 2007:19854. Liu W, Dan H, Wang Z. IFN-gamma and IL-4 in saliva of patients with oral lichen planus: a study in an ethnic Chinese population. Inflamm 2009; 32:176–181. Thongprasom K, Dhanuthai K. Steroids in the treatment of lichen planus: a review. J Oral Sci 2008; 50:377–385. Li J, Luo DF, Li SY. Efficacy of intramuscular BCG polysaccharide nucleotide on mild to moderate bronchial asthma accompanied with allergic rhinitis: a randomized, double blind, placebo-controlled study. Chin Med J 2005; 118:1595–1603. Miao JF, Zhang YS, Huang GQ. Polysaccharide nucleic acid of Bacillus Calmette Guerin modulates Th1/Th2 cytokine gene expression in lipopolysaccharide induced mastitis in rats. J Agric Sci China 2009; 8:1010–1018. Jin TH, Nguyen L, Qu T. Improved formulation and lyophilization cycle for BCG vaccine. Vaccine 2011; 29:4848–4852.